"Story Time! ", known as "Embers of a New Battle" in the Japanese version, is the twenty-first episode of the Yu-Gi-Oh! 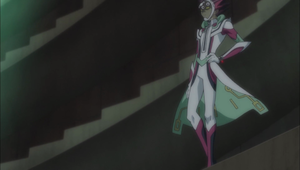 VRAINS anime. It first aired in Japan on October 4, 2017, became available with official subtitles via Crunchyroll on the same day, and aired in Canada on November 10, 2018. This episode is a clip show.